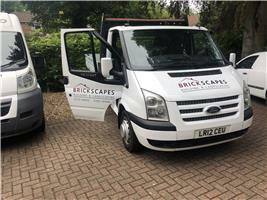 Brickscapes - Builder, Landscaper based in Bagshot, Surrey. Brickscapes is a family owned business run by brothers Sean and Rikki Owen with over 20 years’ experience each in the building trade, after both starting work on their late father’s building business and serving full apprenticeships they honed their skills working on the vast mansions and houses in Surrey and London. Sean and Rikki Owen both started their careers in the building trade working for their fathers building business serving a four year building trade apprenticeship working on the grand homes and buildings in Surrey and London. Through the years they worked on TV shows such as top gear and have completed building projects all over the world. After working on overseas projects Sean moved to Australia where he set up his own successful building business for eight years. After missing home and returning to the UK, Sean and Rick decided to continue the family business and set up Brickscapes which soon become a sought after business in the building and landscaping trade. Please do not hesitate to contact Sean and Rikki with your individual needs, we look forward to hearing from you. Bagshot, Ascot, Guildford, Camberley, Woking, Surrey.